City Hostel Seattle is located in a newly renovated 1920's hotel, so character runs rampant through our halls! 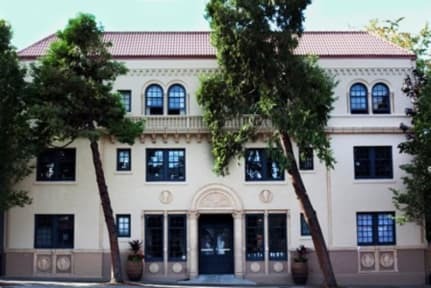 So do Mae West and Humphrey Bogart, in art form as this historic hotel used to house all the movie stars back in the day! The rooms are designed and painted by over 47 different local Seattle artists! Come appreciate and take part in our Art Hostel, open minds are a must! Cancellation is due by email only, 24 hours prior to check in time (2 pm). Late cancellation or no shows will be charged the 1st night stay only. Valid Passport / ID required. Guests must book using a credit card in their name. We welcome guests of any age, however booking with children aged 0-9 must stay in a private room or book all beds in a dorm room. Booking with children aged 10-17 is ok in shared dorms if parent/guardian is present and also staying with us. If travelling with children, please enquire about our family rates! 7 nights is our max, though we do occasionally make exceptions. Just email us about the nature and length of your stay and we will get right back to you! Very clean facility and friendly staff! The hostel was pretty empty when I was there, but I didn’t mind. Breakfast is also minimal but enough to get your day started. The theatre room is pretty cool, you can even watch Netflix in it! City hostel is very economical and is located in heart of the downtown.... commute to plethora places is comfortable and most importantly great ambience inside and outside. Great location! The staff were all really friendly. The building is older, but everything was clean. It was helpful having a sink in the room too. More outlets in the room would have been nice (especially with the bunk beds) but otherwise no complaints. Would definitely stay again! It was overall good but at night, it is a bit noisy.. I guess there is a club near there so I could hear the music sound and people chatting loudly outside. The room was clean but it made a noisy sound when we lay on or move on the bed. Also, the shower room was big and clean but the water was not hot enough while I was taking a shower so i had to wash it so quickly. The water pressure was strong and good but it was cold. The location is so good. It is near downtown, pike place and space needle. Surprising value for money in Seattle, let alone 2nd Ave. Belltown. Physical facility good -- but staff performance & behavior problems highlighted by even such small routine maintenance as supplying a working remote and refilling TP. 3 of 4 staff engaged showed performance and/or behavior problems. One eventually did better, only after repeated disrespectful sarcasms. Desk staff repeatedly, falsely said patio was open. Getting working remote, by (heavy lift!) new batts was an extended problem. Very Basic and functional play for stopover. I didn't have a great roommate though...Was very rude.. the staff was very friendly though... The crowd isn't the same as you would experience in other hostels in Europe or South East Asia .. Its just a cheap stopover option..